This recipe is inspired from a dish I used to make when I worked in the catering business. We used to serve individual bite-size shrimp skewers with a dipping mango sauce as a canape to be passed around by waiters at cocktail parties. The basic premise is that mango and shrimp are a great pairing, and that marinating the shrimp in herbs gives it great freshness and flavor. I like to serve it in a more casual way for family and friends, but it's easily made suitable for a fancier occasion. I find shrimp to be a surprisingly easy ingredient to use. Meats, chicken and fish can be a little tougher because you often have to use a thermometer, or know how to touch the product to know its level of done-ness. Shrimp however, is done when it's entirely pink in color, which is generally very fast! The trick, I think, is to not overcook it, because it can quickly become rubbery and chewy. For this shrimp marinade, just be sure never to use the juice from the lime because the acidity in the juice will cook the shrimp in no time. To me, the more shrimp, the merrier! In a blender, add the green onions, garlic, cilantro, parsley, mint and zest. Blend until the mixture is homogeneous. Continue blending while slowly adding the olive oil. The final result should look like a thick and chunky pesto. Season with black pepper. Place the mixture into a sealable plastic bag. Add the uncooked, peeled and de-veined shrimp. Close the bag and move the shrimp around to make sure the marinade coats each and every one. Marinate for a minimum of 1 hour, but preferably for 24 hours in the fridge. Take the shrimp out of the fridge half and hour before you want to make it. Soak the skewers in a bowl full of water for 20 minutes to prevent them from burning. Preheat your oven to 375 F. Season the shrimp with salt and place 4 shrimp on each skewer. Place the skewers in one layer on an aluminum-lined baking sheet. Bake for 10-12 minutes or until the shrimp has just entirely turned pink in color. While the shrimp is cooking, make the salsa. Add the diced mango and red onion in a bowl. Add the lime juice and stir. Add the chopped mint and stir again. Serve the warm shrimp with the salsa. Enjoy! Sounds terrific and what a pretty square ramekin! Thanks for visiting my blog. Happy holidays. Yup - I bet this is just great. I'm just imagining the flavors and they're making me excited! I love the combination of mint and cilantro! A perfect flavor enhancement for both shrimp and mango. Beautiful photos, by the way. Great presentation! Everything looks wonderful! I agree with the more shrimp the merrier statement. Hmmm mango salsa. I just love mango. a little bit of summer here for me. looks wonderful! I adore shrimp and this sounds amazing - I can't get over how beautiful your photography is! Thank you for this lovely recipe! Gorgeous photos and I'm sure it's delicious. If I was laying on the deck chair at a resort and feeling kinda hungry...I'd order something like this, tropical, seafood and lime juice. I love the elegant look and presentation you gave this dish! 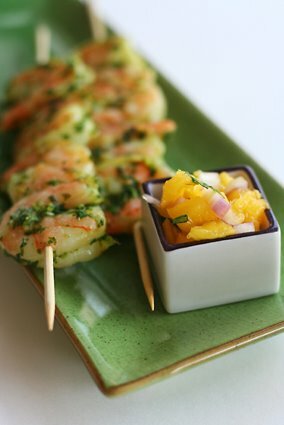 The mango and shrimps combo sounds wonderful together with that red onion salsa - so much yum in one dish! mmm! I love shrimp with mango...now this is even better! Great post! That is a fabulous photo, and the salsa has my name on it! Sounds perfect for the weekend! Did you use black tiger or white pacific shrimp? That shrimp looks fresh and good! cherie: I used white pacific shrimp, but I'm sure either one would work nicely. I agree - shrimp and mango go together perfectly. And this looks delicious!! Mmm. looks so delicious! The colours are beautiful too! Yum! Your presentation and photo looks beautiful and I'm sure tastes wonderful too. Shrimp and mangos are a perfect combination! Perfect for a party tray or anytime of the week!